We’re reinventing our career advancement Nonprofits@Noon series into monthly professional development mini-workshops with an added networking activity at the start of each event. BONUS: All N@Ns will be hosted at the Community Foundation’s new space in Scott’s Addition! Can’t make it during the day? 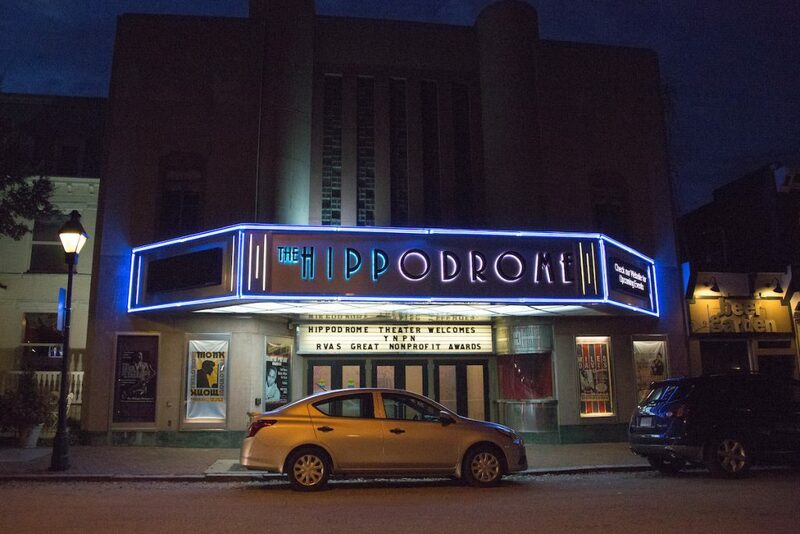 We’ll also be hosting several Nonprofits@Night! 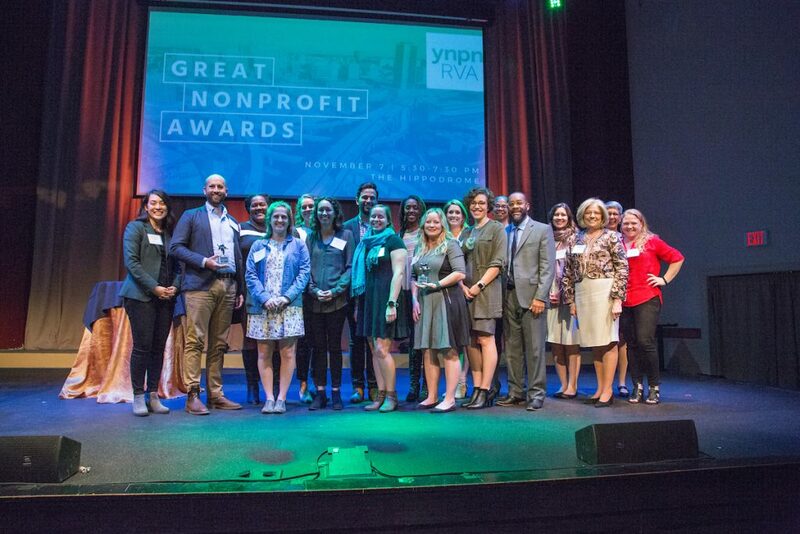 For our Nonprofit Happy Hours, we’ll get to know each other and the city with get-togethers in different neighborhoods around RVA. Early riser? Join our members-only Nonprofit Articles Club! It’s our version of book club where we’ll share, read and have engaging conversations on interesting topics relevant to our lives and careers at different coffee shops around the city. 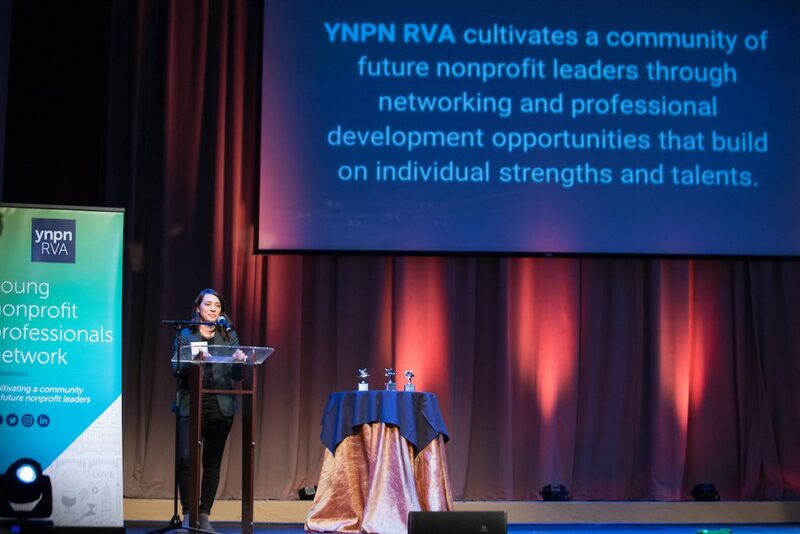 Stay tuned to YNPN RVA’s page for program updates and learn how you can become a YNPN RVA member! Before the announcement of the Great Nonprofit Boss winners, Erica asked the audience to discuss, what do you value in a great boss? Linda Whitaker, VP of Administration and Human Resources for ChildSavers – Linda is a great boss for young professionals because she cares about her staff’s personal and professional successes. She keeps her ear to the ground, finding opportunities for them to expand their skills and gain new experiences, and pushes them to attend training and networking events. 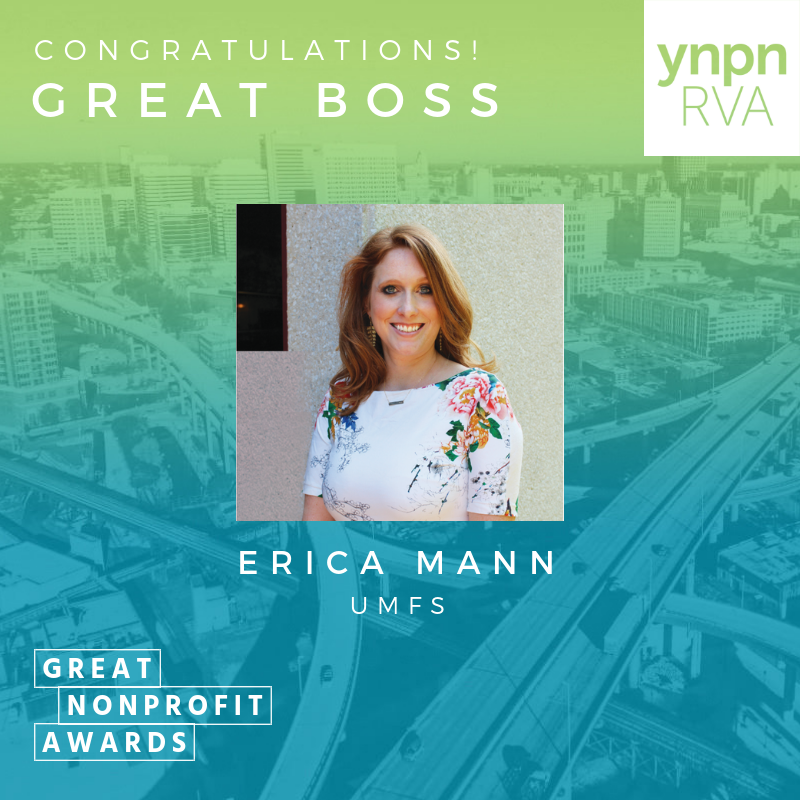 Erica Mann, Regional Director of Community Based Services at UMFS – Erica is a great boss for young professionals because she leads by example. She’s out in the field serving clients right beside her employees, while also coaching and empowering them to be confident, capable young professionals. Nadine Marsh-Carter, CEO, Children’s Home Society of Virginia – Nadine is a great boss for young professionals because she celebrates her staff. She regularly recognizes their accomplishments and successes with her monthly “kudos” awards and end of year celebration. And the winner was: Erica Mann! Erica shared how a personal family tragedy inspired her to go into the nonprofit field and how her staff motivate her every day. The audience was then asked, what challenges have you overcome and learned from in your career? 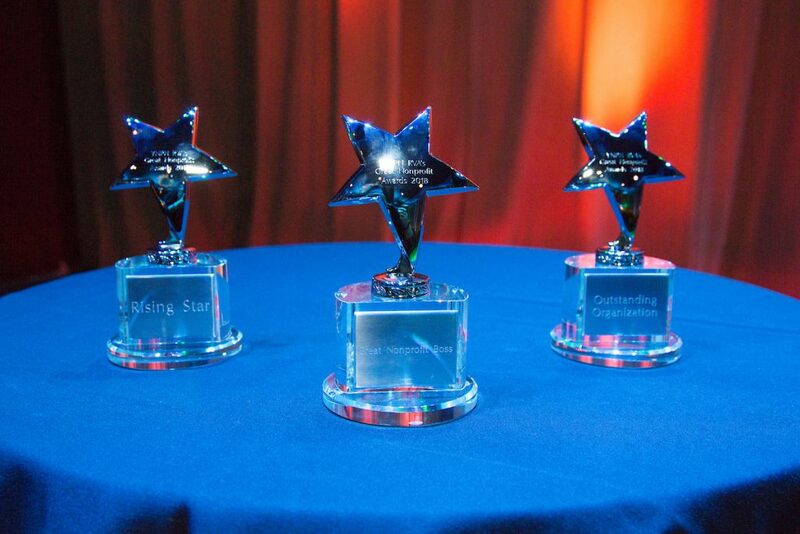 Next the finalists for the Rising Star were recognized. 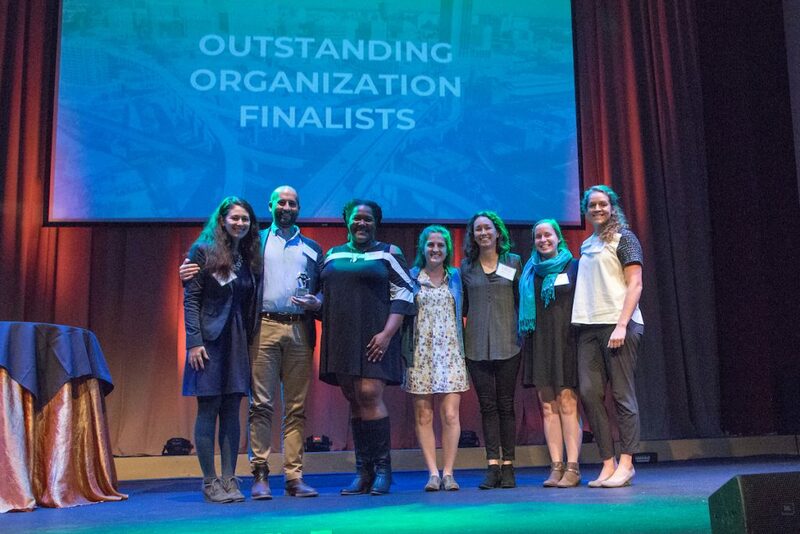 They were Jackie Washington, Center Director for 6 Points Innovation Center with Storefront for Community Design – Jackie is a rising star because she’s devoted to her organization and the teens they serve. She joined the organization as an intern during undergraduate school and stayed on through her graduate studies making a lasting impact even when working part-time. Erica Babcock, Marketing and Communications Officer at Better Housing Coalition – Erica is a rising star because her innovation and creativity knows no bounds. Her dynamic, multimedia marketing campaign helped Better Housing Coalition exceed its fundraising and digital engagement goals for its inaugural “non-event gala” this year. Matt Morgan, Deputy Director of Neighborhood Revitalization for project:HOMES – Matt is a rising star because he takes initiative in times of need. He took it upon himself to create an emergency cooling initiative two years ago, in response to a lack of funding for air conditioning for local people in need. 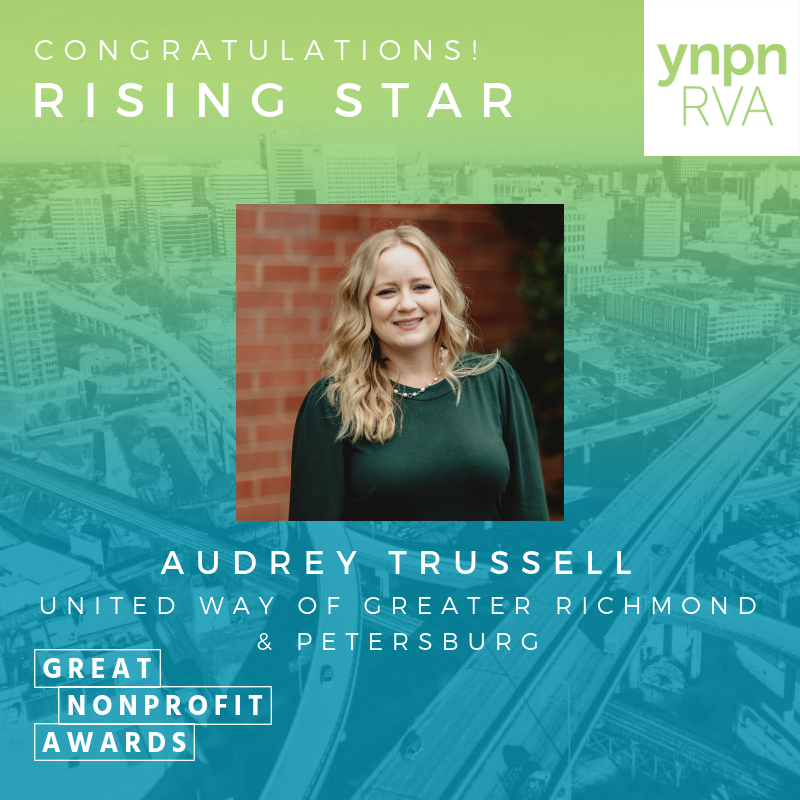 Audrey Trussell, Director of City and Schools Partnership with United Way of Greater Richmond & Petersburg – Audrey is a rising star because she’s an innovator. She is leading a coalition to implement a school-based health center in Petersburg City Public Schools, one of this first of its kind in Virginia. And the winner was: Audrey Trussell! Audrey thanked her colleagues, family and encouraged the audience and nonprofits around the room to continue a spirit of collaboration. The audience was prompted to discuss If you had an unlimited budget, what innovative program, project, or initiative would you do at your organization? Blue Sky Fund, a nonprofit that provides transformational experiences for urban youth through outdoor education. Blue Sky Fund is a great organization for young professionals because it pays for professional development. Each employee gets an annual stipend to attend classes, workshops and conferences. Children’s Home Society of Virginia, a nonprofit working to find permanent adoptive homes for children throughout the state and provide critical support services to their families. CHS is a great organization for young professionals because they believe every employee’s input is important. They are always asking for feedback and innovative ideas from staff at all levels to help drive the organization’s mission. Lynnhaven Academy, an independent school for grades 7-12 working to help students discover their strengths and unlock their potential. Lynnhaven Academy is a great organization for young professionals because they are intentionally diverse. They recruit employees in Virginia and beyond, connecting with Black Colleges and international employee agencies. The members of their board also reflect this intentional diversity. 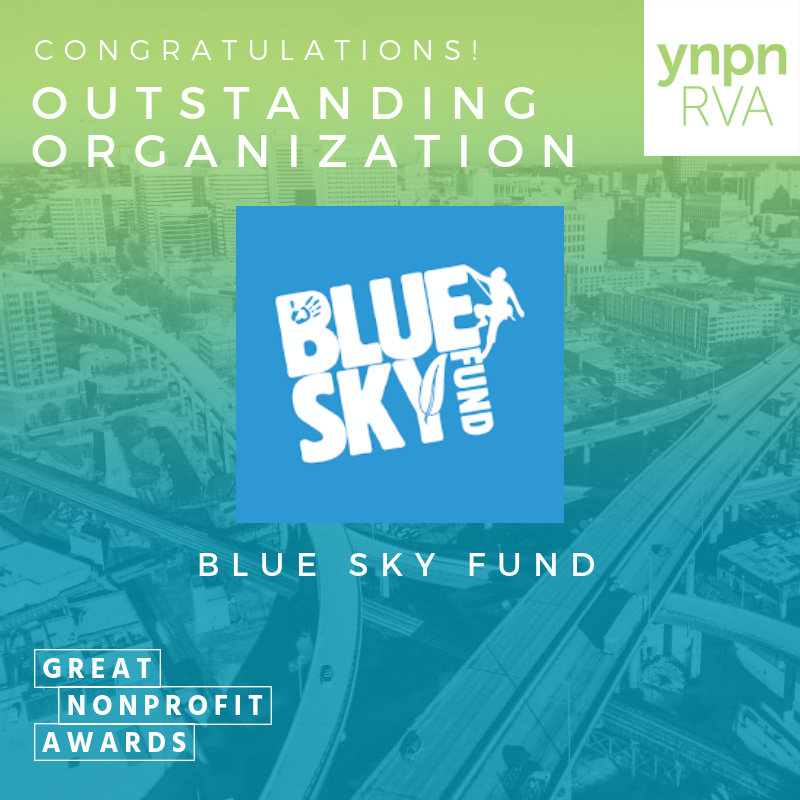 And the winner was: Blue Sky Fund! David Kunnen, Executive Director for Blue Sky Fund, along with five other staff members accepted the award. David shared with the audience, that at the age of 37, he is the oldest staff member at Blue Sky Fund! When he joined the organization in 2016, he knew how important it was to cultivate his younger staff as the organization was going through a time of transition and growth. The evening of celebration ended with time for networking, drinks and food. 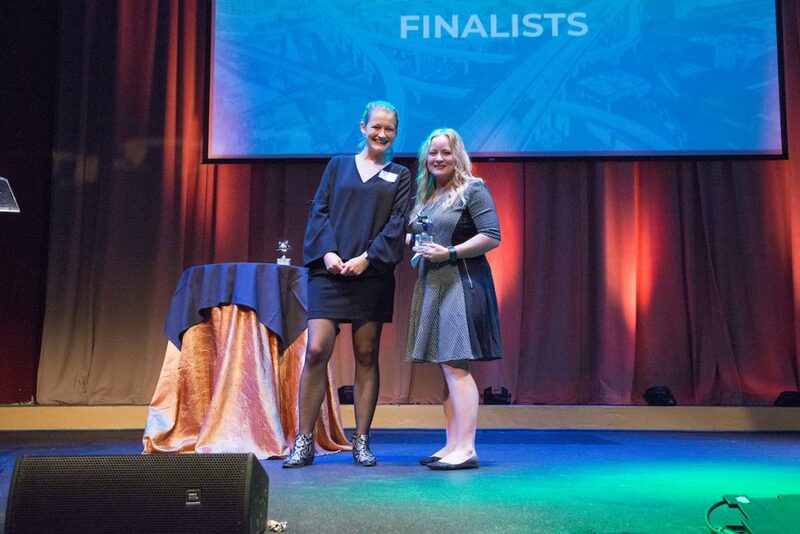 A huge congratulations to all of the nominees, finalists and winners! 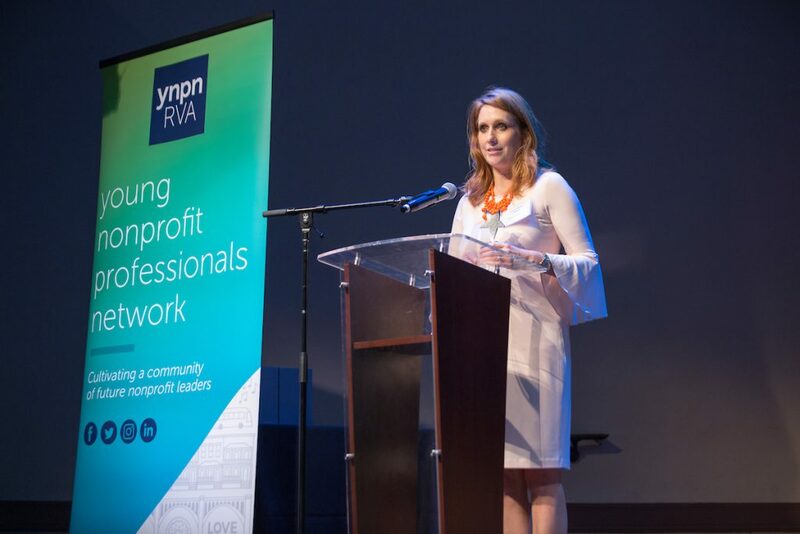 A special thank you goes to the Community Foundation, The Spark Mill, Kim Lee Photography, and the YNPN RVA Leadership team for helping to make this event possible!